Snaglines were not the most popular type of fishing gear used by the Myette Point fishermen. This was not because they didn’t catch fish but because they were so difficult to handle. The b asic idea for a snagline was the same as that of crossing – tie a main line across a bayou and suspend hooks from that. The difference was in how many hooks you tied and that you didn’t bait them – not in the ordinary sense anyway. To skip the part in the process of having to secure bait and bait the hooks with it was a big attraction. It seems that the basic idea was to place so many hooks in the path of fish that they would literally snag themselves on the bare hooks. And the opinion of those that used them, and saw them used by their parents, is that they did catch fish but they weren’t worth the trouble that was required to put them out, maintain them, pick them up and put them back. This was especially true when only the undesirable cotton line was available. So, most people tried them and then went back to the more widespread use of baited bentlines and crossings. The statements of three of the interviewed fishermen follow. Russell Daigle (born 1934) used the lines early in his fishing career, and he is one of the few who seems to have had good things to say about this type of rigging. He explained about his technique of getting a snagline strung out across a bayou, probably the most difficult part of the process of setting one. In what he is describing, the line was already made up with the hooks on it and arranged on a device so that they would slide off into the water without getting tangled. One mistake of going too fast or having to stop in the current and untangle something would have resulted in a disastrous and dangerous mess. JD: Do you remember anybody ever usin snag hooks to fish with? RD: Snaglines? Yeah, I used em. That’s hard to fish. We used to use a rod, we had a double steel rod. The two [rods] would stay together and you had to si t there and lace all them hooks on that rod. A crossin Bayou Boutte…I’m tryin to remember, I think it was 600 hooks. It was 600 hooks, and it would take about three rods, or four rods to put that much on. So you had to have em in different pieces. You started the first hook and you had to set there and put every hook on that rod. It’s to put it out [that was hard]. You had to run it on that rod so where when you take off to put it out, them hooks would come off one at the time, on that rod. You see, you hook the hooks on and you got a jammin rod on top, not too tight but to keep them hooks from jumpin. And uh, a rod about that long - I guess four feet, four feet. And you had to set there, each one. Slide the hook off… They pull their ownself off. JD: OK, they pull off by themselves as you go out more from the bank. So you got as many as you can put on that four-foot rod. Would you put the whole line’s worth of hooks on that rod? RD: No, you couldn’t put the whole line. You couldn’t put 600 on…put about 300 on a rod. You’d have to stop and tie [the end of] the other main line to the other rod and take off again. I made em both ways. I made em right on the line, and I’ve made em…tied em on the line. I ra ther make em on the line, because you used to catch a lot of them big gars and you’d slip em if you make [the hooks] right on the line. That [snag line] catch everything! Buffalo, gous, gar, goujons, catfish…but you also had to know what you was doin with em. If you didn’t know what you was doin with em, you wastin you time. Maintaining these lines wasn’t easy either. According to Russell, they had to be taken up and treated in something that attracted shrimp. This would be a less known feature of this kind of line. No one else independently confirmed that this was a widespread practice, but there are details here that are interesting. RD: You got to pick that up every seven or eight days. You can’t leave em out. Snagline works on a principle [that] shrimp’s what catches the fish. You make you molasses…we used to use cottonseed oil and I don’t remember…something that’s gone sweeten that line up, make the shrimps come to it. RD: Yeah, the line, the hooks and stageons. RD: Yeah, built some out of cotton. And you had soak that in there, we used to soak em about two days. And the main line, stageons, everything. You put it on your rod first, you have it all ready and put it to soak. And then when it’s soaked enough, you dry it, until that stuff dry on it, so it will last longer. And then you go put it out. But if you leave em out there, they get to where they won’t catch nothing. You got to have that to where it will draw the shrimps. JD: So, did you ever pick em up and reuse em on those rods? RD: Oh yeah, yeah, yeah. Uh, I had three at one time. I think it was three. RD: Yeah, and uh, I’d fish three of em, and I’d go pick em up. When I’d pick them up I’d have three more, I’d put in its place. And then I’d rework those three while them there was fishin. JD: Well, they call em snaglines because people always thought that they hooked the fish when the fish wasn’t even interested, the fish passed by and it would hook em in the gills, or something like that. RD: They believe, but they all wet about that. They uh, they make a pass at a bait, a shrimp or something, and that swirl will catch em. I catch some on lines out there now, the fish is there but they won’t bite. Some hooked by the tail, some hooked by the gills. Like when they make a pass at the bait, when they go to turn that hook’ll grab one now and then. JD: So it was actually makin the line…uh…you actually made it like bait for shrimp…the shrimp would be attracted to the…fish would be attracted to the shrimp on the line, hangin on to it. RD: That’s what it amounts to. Used a lot of molasses, and uh, brown sugar…we used brown sugar already. And we still used that oak…that oak stuff. It makes like a paste when you boil it down enough. You put the molasses and uh, cottonseed oil in it and whatever attracts shrimp. We even used pogey meal. We run em twice a day. Didn’t want to let em set too long cause a fish get hooked anywhere, and it would die. Cause you take, uh, a 30 pound blue cat might have ten, twelve hooks in im. And he get one, and he go to millin then he gone keep pickin em up. That’s where that Yellow Tag was the best hook in the world for that, sharp, sharp and had a long point on it. JD: And did they catch good, those lines? RD: Yeah. They catch better when you get a big norther or something, during the wintertime. Anything to move em [the fish], big high tide or anything, they’d catch good. JD: Now, yall stopped usin those kind of lines. Why? JD: OK, they got illegal. I knew they got illegal, I didn’t know if that’s what stopped yall, or… It sounds like it’s an awful lot of trouble, though, to…to go to…to use lines like that, Russell. RD: It’s a lot of trouble, but it don’t…you not confined to one fish. You could catch just about any fish that’s gone swim. It’s deadly on spoonbills [paddlefish]. Oh yi, they ain’t got a chance! JD: But you’d never, uh…could you sell spoonbills? RD: Oh yeah. Once upon a time they had a good market on em. Had he ever tried to eat one of these fish? RD: I tried, I don’t like it. Oily, oily. Taste like cod liver oil. JD: Well, why would people have bought that to use, I wonder? RD: I don’t know. But they did. They still got a big market on em up north. They got people up there, they uh…they live by spoonbills. They got some lakes up the country…watching a piece on TV, there…they trying to control em a lil bit so they don’t catch em out. Other people had mostly negative memories of experiences with snaglines. Apart from the description above of treating the line with a substance to attract river shrimp, the main idea seems to be consistent – a main line with hooks four inches apart suspended from the main line on loops in the main line or on stageons suspended from it. The black and white pictures used here are all of people from the Myette Point community courtesy of the collection of Ms. Darlene Soule. The river is at 7.9 feet on the Butte La Rose gauge, going to 9.0 feet by New Years Day, with no end in site. The Mississippi and Ohio are both doing what they do best, bringing water to us. When I think of our young people today in the universities, I a m often distressed by the extent to which they are unprepared for life in the real world. Maybe some of them have the talents needed to survive, but most are simply not engaged enough to graduate with good problem solving skills. Whatever the cause, it seems to start way before these kids get to college. I truly do wish them well, and I hope they have chances to do some of the things I have done, if not in specifics, at least in form. Sometimes we are lucky enough to get tested in a way that real failure is very possible, and real success very rewarding! The following story could have gone either way. It is one of the longer postings to this blog. In the early days before the Basin began to fill with sediment, the only shallow water to exploit was to be found on the lake or bayou edges and in the swamp during the annual high water season (February to May). During the high water there was too much current to fish long bentlines in Grand Lake, and for the same reason fishing crossings in the bayous was more difficult too. So, during this part of the water cycle, people would set bushlines and tightlines in the flooded swamp. In a way, a tightline was the easier of the two to set. Instead of tying one bushline and then looking for another place (limb) to set the next one, you would get to string out ten or more hooks at one time before looking for the next place to tie. Additionally, the tightline soon become even more popular because the natural processes that had been at work in the Basin since the flood protection levees were built now began to provide shallow areas that were not within the “old swamp”. As the Basin filled with sand more and more shallow places with clean bottoms rose from the lake bed, mostly between the sandbars that eventually became dry land, and some just out in the open lake in places that would soon emerge from the lake bottom. These shallow places, all with young willows growing along the edges, were the ones that became the places to set tightlines. After a little trial and observation, it became known that just as fish would leave the deeper channels and move to the flooded swamp during high water, they would now move into the shallow areas between the sandbars. Such places became known as “coves” and names like Schwing Cove and Raymond’s Cove are still on the maps today. Raymond’s Cove would eventually play a significant role in the stories told by the Myette Point fishermen. In 1972, the year before the Mississippi almost succeeded in emigrating westward, I was just experiencing my first full cycle of learning to fish with lines in the Atchafalaya Basin with a commercial goal in mind. And I had just begun to successfully set out and run bentlines when the water began to rise in November and make my bentlines unusable. The debris (“trash”) that accumulated on the lines due to the rising water and increased current was responsible for this. So I went back to my mentors, the experts at Myette Point, and asked how to fish in this new situation. They told me that the best option at this time was to fish tightlines. OK, where? In Raymond’s Cove, they told me. So I went to Raymond’s Cove and, after scouting it (for what I wasn’t sure) I did what they told me to do. That was to cut some poles about ten feet long and push them into the mud about 50 to 70 feet apart along the edge of where the open water met the small willows growing along the sandbar. Raymond’s Cove was a pretty big place, having extensive areas of shallow open water bordered by submerged sandbars with their small willows emerging from the water. The water was only about four feet deep in this location, and milky/cloudy with silt. Talk about taking something on faith. By now I was wholly committed to deriving my income from fishing, and I had never set lines like this. But I did what they told me as best I could and as well as I thought was necessary. There were so many questions to answer when I got down to actually trying to place the lines and hooks in the water. Poles – how big? How deep to try to sink them? Did it matter? Where? Knots – what kind? And so on. Looking back I’m tempted to think this was a rite of passage. They may have been thinking that either I could follow directions and do this right, or I was probably just a friendly person who was too dumb to do simple things like set tightlines. When you take the fork in the road that leads to learning survival skills like this, college degrees don’t count for much. It really wasn’t a surprise to realize this, but sobering anyway. S o I pushed down the first pole and tied the main line to it about six inches above the water, and paddled along the edge of the willows about 20 feet and the ball of line that was unrolling in the boat jumped overboard. Luckily it floated long enough for me to grab it. In doing so I noted how very cold the water was (November). Continuing along the willows I set the next pole and, knowing this was a TIGHTline, I pulled, and pulled, and pulled the first pole out of the bottom and it came floating toward me. Put the poles well down into the mud, I told myself, and did on all the rest of them. I then put a total of ten poles down and tied the main line to each with a knot that allows you to secure the line in one long piece without cutting it. By now I knew how to do this to avoid cutting the main line at each pole and then having to retie pieces together when you pick it up to reset it somewhere else. Myette Point people don’t like main line with knots in it so retying short pieces together was not what you do. At first I thought this was silly and why worry about something as small as whether there were knots in the main line but later it was clear that when that line was used in bentlines each knot served as a place for trash to collect and stiffen the line. And, most knots are weaker than the line itself. Small things matter. I then tied stageons onto the main line. The hooks hung down about six inches below the surface. For bait I either used cut bait (mullet or shad) or river shrimp. This was cold water, not muddy, so probably cut bait. When I finished I had worked most of the day and had put out only abou t 100 hooks, out of the 1000 thought to be necessary. And I remember looking back down the 700 feet of line and thinking “This is either a good idea done reasonably well, or due to my ineptness a completely useless way to fish”. Either was a real possibility at that point. Next day came very cold and windy. I put my boat in the water and started the motor to make the ten minute run to Raymond’s Cove. Open-boat running in November can be a cold thing to do. When I reached the line I had set, I didn’t see any evidence of fish on the line – no tugging, no pulling underwater, no dripping line. But when I got to the first pole there were fish. Relief came. What really surprised me was the size of the fish. They were five pounds, ten and lots in between. Most were those blue cats about three or four pounds that look so sleek, like sharks almost, and whitish in the cloudy water. As each fish flopped into the wellbox in my boat, a measure of confidence built up in my previously unsure state. I don’t remember how much fish there was that first day, but probably not as much as I remember. The thrill of succeeding at something new like this was so overwhelming that carelessness was a distinct and predictable next phase in my education. Cold water makes stiff hands that are clumsy in handling sharp hooks, and I paid a price to learn that. But even so I couldn’t wait to put in more line and catch that much more fish. I did put in more line, but the inherent variability of catching more fish caught up with me and soon I realized that it isn’t that easy. When I expressed this to my friends at Myette Point, they asked me how many of the lines I had moved. Moved? Yes, rather than waiting for the fish to show up, you have to move lines when they don’t produce. Moving line takes time away from fishing line. Oh well. When I brought my fish in that first day to sell to Myon Bailey, several of my friends were sitting in his kitchen being paid for their fish. When asked how I did, I mentioned the fish I had caught. Apparently it was enough for the men to say just enough positive things to make me feel like the rite of passage had been passed. I wasn’t too dumb to learn how to do this after all. Being accepted in this way by these men was one of the most important things that has ever happened to me – on a par with seeing my son being born and killing the first duck with a shotgun, both first order primal experiences, I think. So I fished tightlines in Raymond’s Cove all that winter until the water began to recede, which it did earlier than usual that spring, as I recall. By the time I stopped and began to resume setting bentlines in Grand Lake, I had a modest understanding of how, and where, tightlines were set and run during high water in the winter. The river is at 7.4 feet on the Butte La Rose gauge, heading up and up for the next several days. The Ohio and Mississippi are both getting water. Have to retie the dock tomorrow. 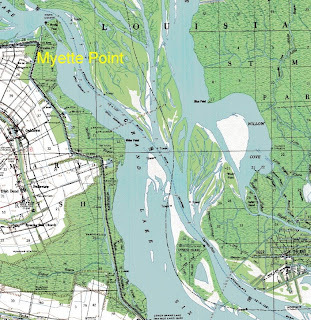 Continuing with the theme of discussing the types of lines that were set by linefishermen of the Myette Point community, we can do crosslines next. 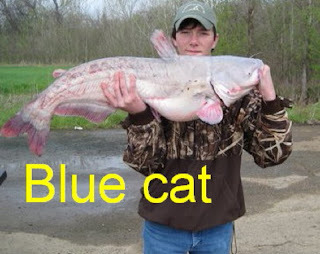 When people think about fishing catfish, the term “trotline” often is used as a catch-all for the various ways to set lines. The term is usually meant to describe a line that spans a bayou from bank to bank. In Myette Point descriptive terminology, that type of line is called a crossline, or crossing. By now it would be apparent that the type of waterway will probably determine the type of gear used to fish it. Wide reaches with constant current allow, or require, the use of long reaches of line (bentlines), while bushlines are used for fishing areas of diversified habitat like the floor of a flooded swamp or the edge of a lake. In keeping with this idea, a bayou presents a different opportunity, a place with two obvious tie-points, the two banks – between which a line can be stretched. Set correctly, this line will fish the whole body of water, from shallow banks to deeper middle, and therefore sample all types of habitat the fish may be using at any one time. Normally, setting a crossline isn’t hard to do, depending on the distance between the banks of the bayou and the depth of the midstream channel, and the amount of debris on the bottom to snag and ruin a rig of line, and the current velocity. Smaller bodies of water will tend to offer small problems, larger ones, like the main channel of the Atchafalaya River present obstacles that only the most skillful fishermen can overcome. Less skilled people find the channel less fruitful, and frequently more dangerous. 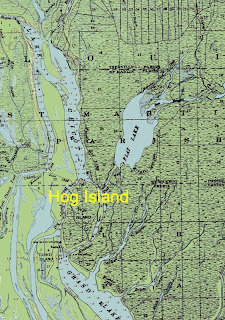 While the Myette Point community fished mostly in the big southern lakes, some of the families had their origins in the Hog Island/Keelboat Pass localities north of Grand Lake. These localities are naturally bayou country and because the type of line set is dependent on the waterway type, the swamp above Grand Lake lends itself to cross-bayou fishing. This is one of the areas where the crossline was the primary tool of the line fishermen. The Couvillier family that settled at Myette Point is originally from the Hog Island/Keelboat Pass area and I asked Edward about fishing up there. You take Keelboat, might have been as wide as from here across the bayou [Teche]. You could take…you could take a crossing clean across …you could tie it from bank to bank. . . . Might have 25, 30 hooks on em. Some 50, whatever, depend on how wide the bayou is. The only time you couldn’t fish was high water…with high water you couldn’t fish bayous. Too much current. Course you could fish, like, uh, Bayou Catfish ‘cause they didn’t have like a main stream that was comin out. It was all branches. Meaning here that the main channels carried most of the Atchafalaya current, and the smaller side channels mostly drained the swamp without being directly connected to the main downstream flow. These smaller streams (“branches”) would remain fishable with crosslines longer than the big channels when the water was rising. See, fishing changed a lot, for me. When we lived up the lake, well, we didn’t have a lake. We had to fish in the bayous. You couldn’t say “I’m gone put 15 bents of line out” cause you didn’t have enough room…just across bayous. . . . until we come down this way, where they had a lake. Start fishing the lake. So, you tie a line to the bank and run it to the other bank and tie it off there. The line is pulled tight, and then allowed to belly out to the expected shape of the channel. The deeper the channel, the bigger the belly allowed in the line. Then you go to the middle of the line and put a sinker there, size depending on the current and depth of the bayou. If the estimation is right, the sinker will carry the line down and just barely touch the bottom, shaping the line to the curve of the bayou bottom. The right amount of slack is important. If you didn’t guess that the channel was deep enough, the line will be too tight and fish will hook themselves and then be able to pull off – like tying a fishing line to a post, a big fish will pull against the post and either pull the hook out or straighten it and escape. If you guessed that there was more depth than there actually is, the line will have too much slack and the fish will have nothing to pull against to hook themselves. Either way, there is poor return for the effort of setting the line. If, however, the line has the right amount of slack, the fish will bite the hook and pull back, meeting enough resistance to set the hook well, and when the fish tries to free itself there is just enough “give” in the main line to allow the fish to pull without either pulling off or straightening the hook. Well and good until the water either rises or falls, at which time the line has to be adjusted by either allowing more slack (rising water means rising current and more trash making the line stiffer), or taking up slack caused by the reduced current. Depending on the width of the waterway , sometimes additional sinkers will be added to keep the line on or near the bottom. There has been a lot of fog the last few days, you could hardly see this tug coming down the river this morning. The river is at 4.4 feet on the Butte La Rose gauge right now, rising to 7.1 feet by this coming Sunday. Pretty fast rise, but there isn't much behind that for the time being. The easiest and least complicated fishing apparatus to use has probably always been a hook tied to a simple line held in the hand. It’s not hard to imagine that tool being used for as long as there have been hooks made from deer bone and line made of some natural fiber. Evidence proving this comes from Native American sites all over North America. And the next step, that of tying the line to a limb or something else that would be limber enough to bend when pulled on by a fish, thereby relieving stress on the line and hook, is not hard to imagine either. The sportfishing industry is supported today by that set of just three things: a hook, a line and a pole or rod. All that has happened is that these tools have been modernized and diversified into an almost infinite number of variations. But, at bottom, they are just three parts of a successful mechanism evolved through practical trial and error to catch fish. And stripped of its chrome and graphite and monofilament, that description also describes the most basic commercial linefishing tool, the bushline, also known as the dropline. 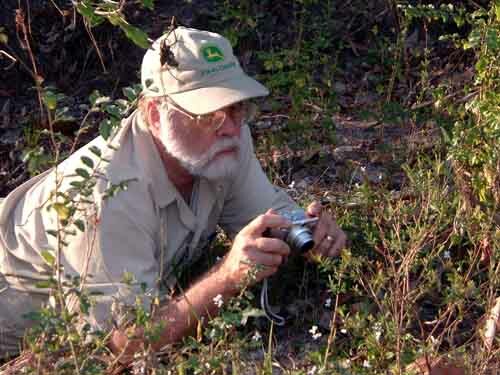 Creating the bushline is simplicity itself. There is no more to it than finding a tree limb in the right place and tying on a piece of line, then tying a hook onto the end dangling a foot or so in the water. To be effective the bait must be presented in a way that is attractive to catfish and in the right place. 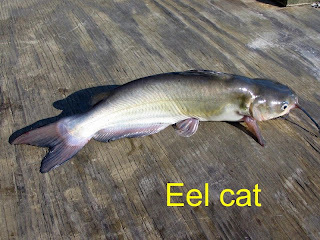 To the Myette Point people, the catfish being sought was the flathead, or goujon, and in some cases the blue catfish, both of which prefer territories near structure of some kind, usually a log or stump in the water. Both of these species reach large size, exceeding 70 pounds, and both are aggressive predators that readily take live bait. Because of their size they were much sought after by fishermen in the Basin. When fishing them, there was a lot of visual excitement caused by seeing evidence of a big fish on the line even before you reached it in your pirogue. The line would be tied to a long, slim cypress limb maybe four feet above the water. Edward Couvillier describes the fun of doing this. I seen, on a cypress limb, a big old cypress limb…not a big one, you know, small, but it would be long? You tie a bushline on there. You go back the next morning, look up there [at the limb above your head], and you see water drippin off of that limb. Well, you know there’s a fish on it. A goujon can take it, he go under the water with it. He take it, go plumb under the water with that limb. When it would come back up, the water would drip off it. You get there in that pirogue and you see that sucker up there…! [excited] In pirogue too, hoss. And maybe the excitement didn’t end there. I remember one time I put a line, I was on a ridge, you know? I got there next mornin. Didn’t have but about that much water [two feet], and that sucker was stiff! I mean that sucker [was] straight down! Boy, I looked at that, and pulled up there, I mean, I pulled that sucker up real slow…had about a seven foot alligator. [laughs]. Boy, he just took off, he ain’t never stopped! He just pulled off. I wasn’t that very big either, just a kid. I was already scared of em. 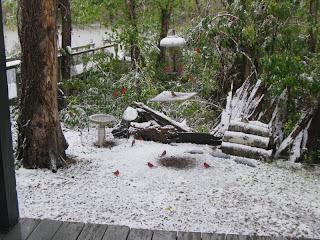 Picture notes: Snow this morning in south Louisiana made national news. And it was spectacular. On the bird feeder in our backyard I count 15 Cardinals and one cryptic Blue Jay. We got about an inch right before daylight and it began melting shortly after. It’s nice to know you have a warm place to come back to if you choose to venture out. The black and white visitor also came in the night last night. It is the first one to come up onto the porch that I know of. The river is still low at about 4.0 feet on the Butte La Rose gauge. The Ohio and Mississippi are both showing a little life up there. We will get a little water next week. JD: Now, a strong, strong current would probably give you trouble…? ID: No, you just longen your bridle. You longer your bridle. When you got strong, strong current, that’s where your slack comes from, your bridles. JD: Where your what comes from? ID: Your bridles? Well, that’s where your slack for your line comes from, from your bridles. You just lengthen your bridles. Jim, I had a boat full of fish, that time, I made Neg sick. He had about eight fish in his boat, and I had about 300 pound, or better, in mine. And I went to him and he was fishin, and uh, the current was getting stronger. Now,the water wasn’t comin up, but the current was getting stronger. Now, I lengthen my bridles, and I went and told him. I say “Neg, lengthen your bridles” I say “That’s what’s the matter”. “Ah, you don’t know, ah…you don’t know”. But, he didn’t catch no fish either. Well, I say “l lengthen mine, I wasn’t catchin none, I leng then mine” and I say “Look my fish”. “Gawlee, you doin the shockin machine, eh?” I say “If I had one, maybe I would”. But I didn’t have none. The shocking machine she refers to here was an illegal device used by a lot of people in the Basin at one time or another. It consisted of a vintage telephone arranged to send an electrical charge into the water. The fact that it was illegal didn’t deter a lot of fishermen, and non-fishermen, from trying it. It was a lot easier than going to the trouble of setting lines, getting bait, maintaining lines, etc. All you had to do was shock the fish and dip them up with a net – so much less trouble than doing it the hard, legal, way. Since river knowledge said that using a shocking machine would drive the fish away from an area, there was constant war between the shockers and the legitimate fishermen w ho were setting lines, even though some of those fishermen would occasionally step over the line of legality themselves. Sometimes living mostly on what fish you could harvest would do more to dictate methods than the law did. Game agents tried with special efforts to catch these people but the shockers always seemed to have a boat that could outrun the agents. When these chases happened at night, things could really get exciting for both parties. One of the tricks the shockers used was to run to the main channel of the river when being chased. There are large buoys marking the channel, unlighted buoys. The shocker would run directly at one of the big buoys while letting the agent approach to within a few yards, all this at high speed with no lights, and then turn a bright light onto the agent’s boat while swerving to miss the buoy at the same time. The agent, blinded by the light, would crash into the buoy and the chase would be ended for that night. I never heard of anyone drowning during one of these episodes. I hope that’s really the case. I was in an agent’s boat during a night chase once but we didn’t hit a buoy that time. Nylon line comes in these one-pound “balls”. From the fro nt of the package you can see the size of this ball: #48. This was the size considered “wimpy” by many of the Myette Point fishermen in that it was so large in diameter that it was easy on the hands. The downside was you got less line per one-pound ball in larger sizes like this. The package shows the selection of sizes available, the number of feet per size and the breaking strength of each size. This is the preferred “black” nylon due to having been dipped in an asphalt compound. The asphalt stiffens the line and makes it much easier to handle, it tangles less and the stageons slip less than on the white, undipped line. 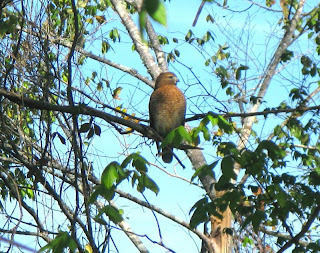 The hawk was in our backyard today at noon. It showed its back and then turned around for a frontal picture. Nice to see. It was overlooking our main bird feeder while 20 or so cardinals, chickadees, titmice and woodpeckers ate seeds seemingly unconcerned. The Red-shouldered is a mammal/reptile etc. 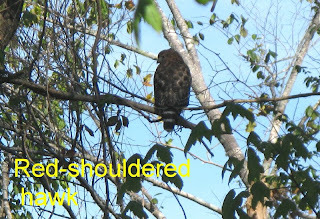 hawk and things would have been different had it been a “bird hawk” like a Coopers or Sharpshinned. But the birds seemed to know the difference. The river is at 2.7 feet on the Butte La Rose gauge, rising slightly to 3.4 feet by midweek next. The Mississippi and Ohio are both resting for the time being.